About several months ago, on graduation preparation, it was the first time I see such an 'elegant' yet rather cheap material. It's an artificial leather a.k.a. imitation, synthetic. It never crossed my mind that such nice material originally come in size as a fabric, wide and long. So I really excited to make a bag from an artificial leather. It's my friend's order, Sakinah, to make a Minho's bag. 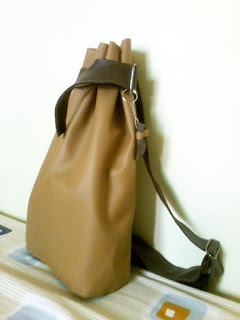 Actually, a bag worn by Minho in his drama, Personal Taste. It's a simple bag, just like a big paper bag and a strap. I forgot the detail and the exact shape of the bag, since I already deleted the video and couldn't find it on the internet. My first attempted to sew an imitation leather using a sewing machine was frustrating. I used a nylon thread,as the seller recommended, but may be the needle's not fit got me more problem. The nylon kept struck and snapped off. I ended up using the usual thread, what I asked here, but I needed to sew it manually (not using the dynamo) when it's thick, because the tension made me headache when I started the machine. hai Dil, aku ada blog award untuk It's B[l]ooming.